This article is deprecated. 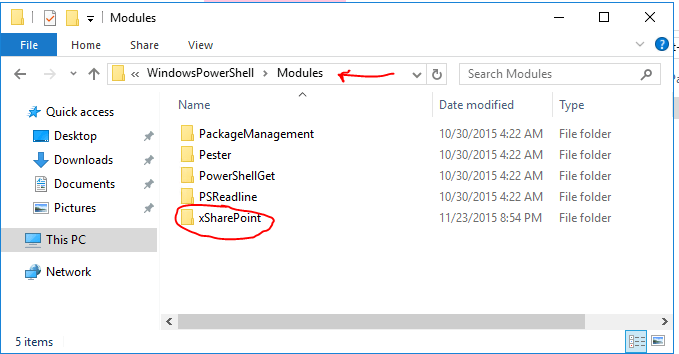 New information on how to use PowerShell DSC to install SharePoint 2016 is available Here. This article is a step by step guide of how to configure a new SharePoint 2016 Single Server farm instance using PowerShell Desired State Configuration (DSC). The example covered in this tutorial is using an Azure Virtual Machine running the Windows Server 2012 R2 image. The first thing you will need to do is go download and configure the xSharePoint DSC resource. While the official bits are officially hosted on the PowerShell Gallery (PowerShellGallery.org), the SharePoint 2016 bits are still only available on the Github repository at the time of writing this article. In order to leverage the PowerShell Get features from the following sections, you will require that the Windows Management Framework 5.0 be installed on your server. 2.2) Install the Windows Management Framework 5.0 on your server. Because this resource is actually located in the PowerShell Gallery we can user OneGet to automatically download and configure the resource. 3.1) In a PowerShell console, execute the following line of code. When prompted to add the package provider and to install from an untrusted location, enter ‘Y’ on both occasions. Just like the xDisk resource, the xCredSSP resource is also available from the PowerShell Gallery. 4.1) To download and configure it automatically, run the following line of PowerShell. Again, when prompted to install from an untrusted repository, enter ‘y’. The story repats itself once more. In order to properly configure your environment, you will also require the xWebAdministration DSC resource to be downloaded and configured. 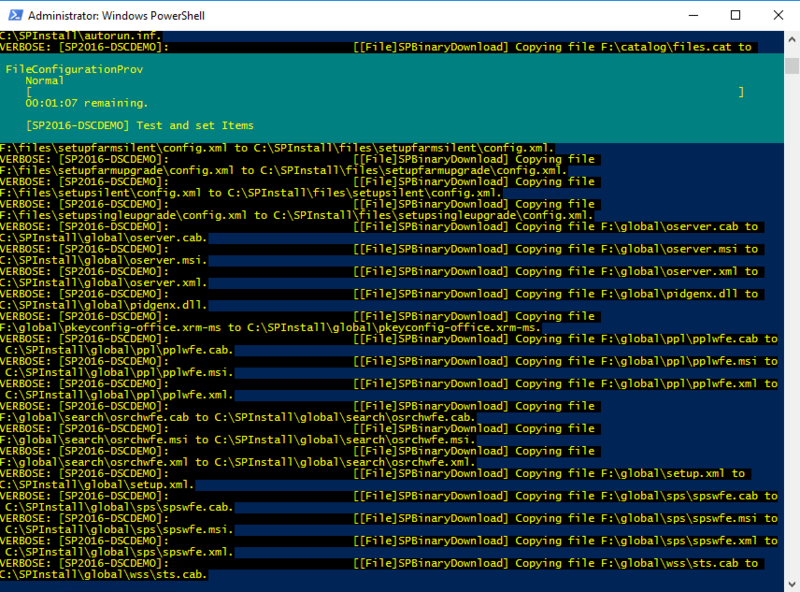 5.1) To download and configure it automatically, simply run the following line of PowerShell. When prompted to install from an untrusted repository, enter ‘y’. Very often, PowerShell modules downloaded from the internet will be blocked, meaning that the Server operating system will prevent their execution. In order to allow the DSC engine to properly configure our environment, we need to make sure all resource files are properly unlocked. To allow DSC to properly execute remote commands (even though it will execute it locally under different credentials), we need to configure the WinRM protocol on our server. Name = "Usage Service Application"
Name = "State Service Application"
Name = "Claims to Windows Token Service"
Name = "User Profile Service"
Name = "Secure Store Service"
Name = "Managed Metadata Web Service"
Name = "Business Data Connectivity Service"
UserProfileServiceAppName = "User Profile Service Application"
Name = "SharePoint Service Applications"
Name = "User Profile Service Application"
ApplicationPool = "SharePoint Service Applications"
Name = "Secure Store Service Application"
Name = "Managed Metadata Service Application"
Name = "Search Service Application"
Name = "BCS Service Application"
Name = "My Site Host"
10.3) Let us now create a second PowerShell script that will be responsible for declaring our parameters, and for calling the actual DSC configuration method, generating the .MOF files for our server. $SPBinaryPathCredential = Get-Credential -UserName "contoso\sp_install" -Message "SP_Install"
$FarmAccount = Get-Credential -UserName "contoso\sp_farm" -Message "SP_Farm"
$InstallAccount = Get-Credential -UserName "contoso\sp_install" -Message "SP_Install"
$WebPoolManagedAccount = Get-Credential -UserName "contoso\sp_webapp" -Message "SP_WebApp"
$ServicePoolManagedaccount = Get-Credential -UserName "contoso\sp_serviceapps" -Message "SP_ServiceApps"
10.4) Let us now execute our script . In my case, I named it Execute.ps1 and stored it under C:\Scripts\ as well. Executing the script should generate two files: localhost.MOF and localhost.meta.MOF. Now that we’ve generated the MOF files that are required to configure our server, we need to initiate a process on the PowerShell Local Configuration Machine to tell it to start configuring our server based on the specifications we specified in our DSC configuration script. After a little while, the Local Configuration Machine will require you to restart your server. After that I am no longer certain which steps should be done on my local workstation and which on the server. Or did I misunderstand and I should create that VM prior to step 1 and do everything on that machine? Yes you are correct. This blog article was really just to introduce DSC in the context of SharePoint. Therefore everything is run on the same VM. I used Azure, so the OS on the VM was all preconfigured. I am currently working on a follow-up article that will go over how to configure your VM from ground up using DSC (including .NET Framework and SQL Server). It should be ready sometimes in January. I have already checked so I have PSDscAllowPlainTextPassword = $true defined. I have seen it whenever a GPO is not enabled to allow the delegation of fresh credentials (and NTLM). For more info, see the folowing article: https://thycotic.force.com/support/s/article/Configuring-CredSSP-for-use-with-WinRM-PowerShell. I think that was the problem, now it is working in my lab env. Nik, Thanks for the steps, i’m having a few issues with the links provided….could you assist? Can you elaborate on what is your issue? The link for WMF 5.0 is broken. I’ve successfully found it else where downloaded and attempted to install on a newly stood up 2012r2 server and was giving message not applicable to this system. I’ve read that you need to make sure that you perform the WMF 4.0 install before 5.0. I successfully downloaded and installed this to the server as well and was giving the same message. Wasn’t sure if I missed something obvious or something that was not described in the article. What message are you given? The update is not applicable to your computer. The target system is a 2012r2 server…am I just really missing something? I’ve updated the link to the WMF 5 RTM, and made sure to put the one for W2012R2. Please try that one to see if you get the same error. Nik, I’ve got everything I need. I really appreciate your quick response to my request.